Experience Points: Review: The Novelty of New Super Mario Bros. Hang around me long enough and you will no doubt be subjected to some effusive gushing about Super Mario Bros. and its influence on the way I view video games. Super Mario Bros. exists as a quasi-sacred entity within my conception of video games. As a child, it set me on the trajectory that guides my gaming habits to this day. I enjoy a wide variety of styles and genres, but nothing tops playing a console platformer. Either consciously or subconsciously, every game I play is in some way compared to Super Mario Bros.
With this in mind, I entered into New Super Mario Bros. with caution. It is difficult enough to follow in the footsteps of Super Mario Bros., let alone directly aspire to present a "New" version of it. It is an audacious goal: The game implicitly calls Super Mario Bros. "old," bringing to mind questions of its enduring relevance. While much of what I found in the game was not necessarily new, it was not exactly familiar. In the end, the most appropriate title for the game may be "Super Mario Bros. Deja Vu." Moving about the world as Mario is a bit like riding a bike: while extended time out of the saddle can make for some initially wobbly rides, some combination of brain and body ensures that one never truly forgets the basics. NSMB feels strikingly similar to the original SMB. Running in one direction full tilt and and then turning in the opposite direction causes Mario to skid. The height of jumps is dictated by the length of button presses, and momentum can be modified in mid-air. Through a combination of speed and faith, Mario can sprint over gaps that are no more than one block in diameter. Mario's repertoire has expanded over the years, and NSMB demonstrates how agile our favorite plumber has become. Mario now does a great Samus impression by wall-jumping his way out of danger, and he has also adopted the ground pound move pioneered by Yoshi. At some point, Mario's enemies took a turn for the springy, which allows the player to use them as makeshift trampolines. In SMB, jumping on a goomba results in more of a "thud" than a "boing." Although the goal of each level adheres to its historical roots, the rules that govern the experience of getting from the starting line to the flagpole have changed. Upon vanquishing Bowser at the end of NSMB (spoiler alert? ), I had amassed over thirty extra lives. A quick play-through of SMB on the NES demonstrated that the availability of both coins and 1up mushrooms seems to have skyrocketed since the 1980s. Thankfully for the Mushroom Kingdom's Federal Reserve, this inflation has done little to harm their value. NSMB softens the harsh realities of the Mushroom Kingdom. The original SMB was a cruel game in some ways: one lucky hit from a goomba would demote even the all-powerful Fire Mario back down to regular old Mario. Checkpoints were often unforgiving, and saving one's progress, seeing a continue screen, or even having a password option were unheard of. In NSMB, an errant koopa shell still extinguishes Fire Mario, but he is able to retain his Super stature. As was the case in Super Mario World, an extra item can be stockpiled for emergencies. Coins are now an actual currency that can be used to purchase power ups and extra lives. If one pays attention, a faint whiff of RPG elements wafts through the game. All of this is committed to record and stored safely in the player's save file. 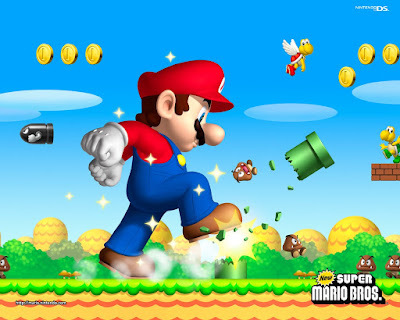 Most of what is found in the game can be found in its predecessors, which initially makes it seem less like a "New Super Mario Bros.," and more like an "Updated Super Mario Bros." From Super Mario Bros. 3's over-world map with branching paths to Super Mario 64's triple jump, this game is a wonderful synthesis of Mario's best evolutionary traits. However, NSMB is more than an exercise in "re-imagining" an old property. The game's amalgamation of Mario's many innovations is its most important accomplishment. As I argued in my review of Super Mario Galaxy, the innovations found in every Mario game are both powerful and subtle; new characteristics seem to instantly become part of how we conceptualize the character and the franchise. NSMB skirts an impossibly thin line: It indulges in nostalgia while simultaneously smoothing out history's rough edges (both figuratively and literally). The beauty showcased in New Super Mario Bros. reinforces Super Mario Bros. as a masterpiece, but it also serves as an articulation of the legend that has grown around that game. Distance makes the thumbs grow fond, and while the frustrations and the flaws of Super Mario Bros. have been subsumed by nostalgia, New Super Mario Bros. ultimately offers exactly what its title promises. It forges the legend of Super Mario Bros. into a real game, and in doing so, gives us something truly new.